IT has taken eight years to develop my shady, urban, child-infested back garden, but it took less than three seconds to destroy it. At around 1.30am on Sunday, I was woken by what felt like the house shaking. Or was it just a dream? My nocturnal other-half came to bed a few minutes later. 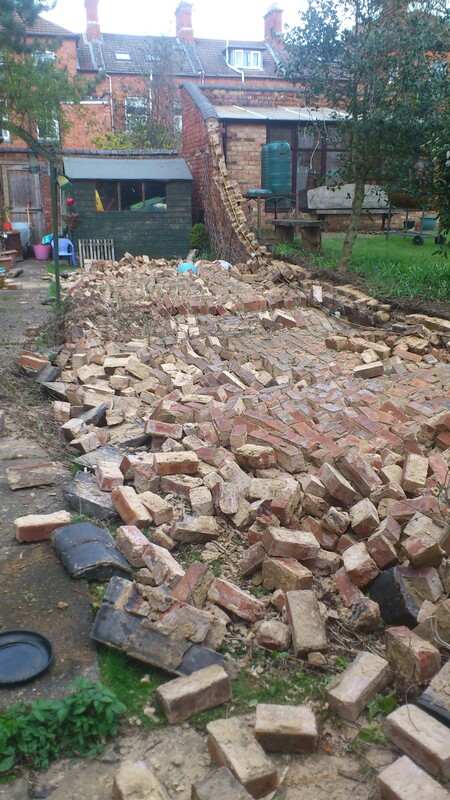 “The wall in the back garden has collapsed,” he muttered, before rolling over and attempting to go to sleep. That wasn’t going to happen. I was wide awake. I went to peer out of the children’s bedroom window to see what he was talking about. It was too dark. Downstairs to the window nearest the garden. All I could see was a sheet of the climber hydrangea petiolaris, hanging forlornly in a sheet, not clinging to much at all. As I peered I could see . . .well, not the garden anymore. Just a sheet of bricks. It was an extraordinary sight. Like an instant patio. To be honest, I cried. Yes, I know it’s just a garden and the fact it happened in the night meant everyone is still alive (it would have killed anyone in the garden, it fell so fast), but after recent nocturnal misadventures, like the car getting squashed and finding a strange drunk man asleep in the dining room, it just feels like we are cursed by bad luck. Self pity? Yeah, but it took me eight years to build that garden. I write about it as a garden journalist. So no, I don’t feel very laid back about it at all. The wall was too tall. A Victorian garden wall, bordering the large garden of our neighbouring house’s garden really, all the way around their’s, just one border on ours. It had stood for over 120 years, and yet collapsed in one devastating sheet of bricks, covering the right hand garden border and our entire lawn. A lawn the kids had been playing on just 36 hours earlier. The following morning it felt unreal to see it. Huge amounts of brickdust covered all the plants and the neighbours’ outside lights, strung presumably on their side, where the ground is a foot or so higher than on ours. Like a horticultural Becher’s Brook. I couldn’t even start to organise what to do next, as sons needed taking to rugby matches and general life needed to go on as normal. Bloke spoke to the neighbours the next day. Discussions, apparently, that involved talking to our respective insurance companies. I rang them, they said they’d get back to us. They did, only to tell us the wall wasn’t covered because nothing had hit it, “like a car or something.” Unsurprisingly, getting cross and emailing them the photos didn’t make any difference. Since then it’s been raining solidly, and each morning when I get up and look out of the window at the missing garden, a little part of my soul wizens. 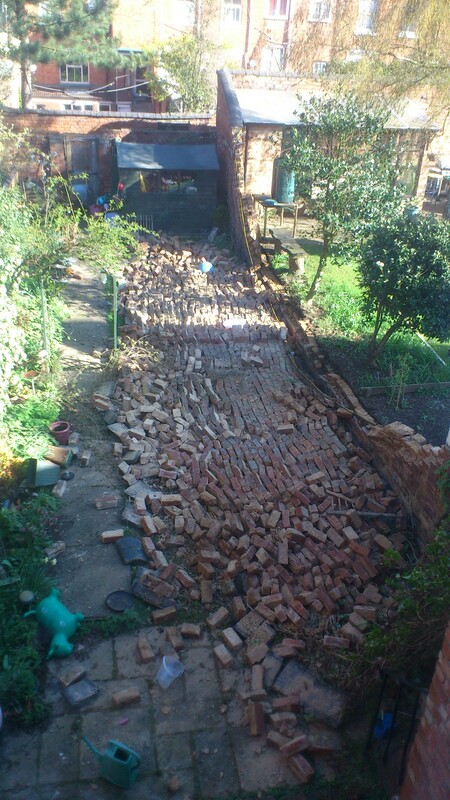 Under all those bricks, somewhere, along with all the other crushed plants, is a snowdrop named ‘Bonnie Scott’, named after my daughter. What to do next? I can hardly face it. Glad no one was hurt. Looks like a lot of work ahead of you to clear it all out, but hopefully you’ll find survivors. I’m so sorry, that looks devastating.